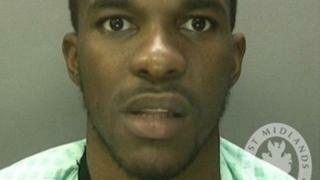 A man who was shot by police after fleeing a house in his underwear with a loaded gun has been jailed. Duane Thomas, 30, admitted possessing a firearm and ammunition at an earlier hearing at Birmingham Crown Court. West Midlands Police officers raided his home in Shepherds Gardens, Edgbaston, Birmingham, in October and shot Thomas after he jumped from a window. The Independent Office for Police Conduct is investigating the shooting. Appearing in court in a sling, Thomas was jailed for six years and four months. Thomas was shot in the shoulder after "bursting" out of a window at about 05:00 GMT on 2 October. A handgun and a sock containing three rounds of ammunition were recovered and Thomas claimed he had wanted to "remove" them from the house so nobody was hurt. Defending, Liam Loughlin told the court Thomas had had "numerous operations" on his shoulder and suffered from nightmares and flashbacks after the "traumatic" shooting. Judge Peter Carr said he accepted the gun "was not pointed at the officers", but could have fallen into criminal hands if it had been removed by Thomas. "You ran out of the property with what was in fact a loaded revolver and ammunition," he added. Thomas is one of four men shot by West Midlands Police since Sharif Cousins in 2017. Sean Fitzgerald and Trevor Alton Smith were shot dead during raids in January and March.